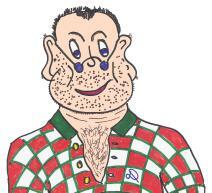 I am really happy that Scruffy has agreed to bring my pal Mathew “HOSS” Vilade on the Scruffy & Pals staff as our long-drive-tips expert. If you are like me and most other guys, hitting it long is fun. Hoss and I have a special bond because we kinda look alike, well we think we do, and we share the same name. 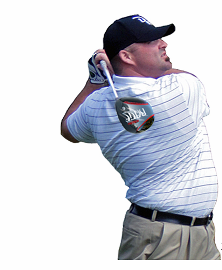 “HOSS” is a Long Drive Professional, a Professional Sports Entertainer, a 4 time World Long Drive Championship Finalist and the 2011 American Power Golf Metter Invitational Champion with a drive of 400 yards!! That’s right I said 400 yards! And he finished 5th overall on the LDA Desert Launch which earned him a spot in the 2011 Long Drive Championship Finals in Mesquite, Nevada. Best of all, he and his wife Danielle, are the proud parents of future long drive champion, three year old Cooper Hudson! Many people ask me " Hoss, how can I hit the ball further?" One of the first things that I like to talk about with people is the theory of ball flight. You would be surprised how many golfers don't recognize that ball flight is a tell tale sign of what is going on in the golf swing. Many amateur players tend to strike down on the ball with the driver, producing high ball spin rates. High spin rates will eat up your distance faster than Kobayashi at a hot dog eating contest. Work on your attack angle and find the proper spin rate. Make sure that you are striking your drive on an ascending angle. Equipment does play a part in being able to achieve acceptable spin rates for your ball speed. Don't forget now, there is also such a thing as not enough spin on the ball. With not enough spin, the ball will not be able to create enough lift for optimal distance. Stop in and see your local professional club fitters. They will be able to tell you what spin rates and equipment will be best for you to optimize your distance. Thanks Mat. I can't wait to see Knothead go ballistic when I outdrive him by another 25 yards! All you have to do is take a look at the photo below of Long Drive Professional Mat “HOSS” Vilade and you will appreciate the next tip he is giving us. Not only is it necessary to be limber…you must be able to hit the ball too. My problem is getting my belly out of the way before my arms get to the ball…I wonder what flex exercise I can try to eleviate that problem? The number one question I am asked at every event and exhibition I go to is, "Hoss, how can I hit the ball further?" OK... here we go. I talked in lesson one about making sure you have the proper equipment and that you are striking the ball well. Those are all very important. But also, at the top of my list and many other golf professionals, is flexibility. Many of you may be surprised by this answer, but it is true. The number one thing I work on is flexibility. Why is flexibility so important? Flexibly increases the range of overall motion and decreases risk of injury. Having a stretching routine can also help you with tension. Getting rid of tension will increase speed and maximum mobility. We all know that tension free muscles are fast muscles. Find a few minutes a day to work on flexibility, you won't be disappointed! Working on flexibility will definitely add some distance to your game. It is a misconception that there must always be a trade-off between flexibility and strength. As a matter of fact, flexibility training and strength training can actually enhance one another. So if you are doing a lot of strength training, don't neglect the flexibility. The number two question is always, "Who is your chiropractor?" Thanks Mat, for another good lesson that we can all include in our game, even if we aren't trying to be a long drive champion. By the way, Mat has a new website, Horsepower Golf. Click on his photo below and check it out! We look forward to Mat's next lesson on how to be a long drive champion- even if it will only be at our local course! Before you leave this page, why not visit our Pro Shop (click below) and order a sleeve of Scruffy and Pals golf balls to use at your next golf outing? Mat's test drive (click here to see results) is proof that they are a quality product and they may even give you the jump start you need for your game. Please remember to place us on the tee facing down the fairway, though, we hate getting hit in the face with those big-headed drivers!